It’s hard to know where to begin. I’m not sure I can reach deep enough inside myself. 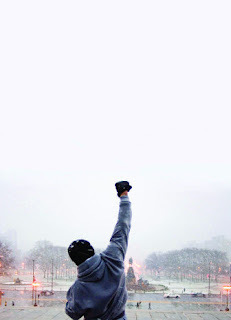 Ever since I can remember, I have had a deep affection for the character Rocky Balboa. In every sense he is one of the most iconic and era-defining creations of modern cinema. He has always been a reflex symbol of heart, guts and glory. He embodies an ethic that’s satisfying and hard not to value: work hard and you’ll get what you want or at least reach a place where you can accept losing because you have given every last inch of yourself to the task. One thing is for sure, I am rating this movie for the way it made me feel. I’m not certain that’s the right thing to do, but it would be a betrayal of everything I have taken from the franchise if I weren’t to give back just a little. Rocky is romantic and that is something worth preserving. When romance is dead or retired or too punchdrunk to shuffle into the ring, then what's left? Not much. Even the heavyweight cynics can't deny that it’s worth getting something out of life. That's what Rocky is about: taking the hits and moving forward in the face of it. Yes it’s simplistic. Yes it’s corny. But it’s true. The devastating emotional connection between Rocky and the audience is irresistible and unmatched. The tireless, dogged will of the hero is such a winner. Motivated by devotion and self dependence, Rocky has never been beaten as an identifiable cinematic force. Never will. There were jokes and jeers at the sight of Rocky, a dumpy and sullen figure. But something stirred the moment the training began. When Bill Conti’s ‘Gonna Fly Now’ piped up, several people blurted out ‘Yes!’ – as if they had been waiting to believe again. The pure aspiration of the music and its link with the battered dreams of glory of Balboa are inseparable. The feeling it inspires is so rare that it’s indescribable. To hear it again was just so great. To be honest, my critical faculties are paralyzed. Stallone has somehow released some surge of faith from a long dormant dark place I had forgotten about. There are moments in the film that just shouldn’t work: laying a rose on Adrian’s grave, pounding that poor rack of beef again, a heart-to-heart with the brilliant but credulous Burt Young, Stallone transparently maudling over the loss of youth. But the resurrection of Rocky, long after we had given up hope of his return, is just too mesmerizing to hack away at with petty criticism. Watching the film is simply a wonderful and emotionally manipulating experience. The opening hour of the film is ponderous and has a great wit to it. The script is emotionally naked and at times awkwardly so. But that's how it is isn't it? People don't always move seamlessly from feeling to feeling. Sometimes it’s embarrassing to watch people cry or open themselves up, particularly those you admire. The script is peppered with gems of bruiser prose reminiscent of FX Toole and Ring Lardner. Rocky refers to the dissatisfaction that remains within him as 'something going on in the basement'. The spiritual poverty of a sedentary life has created a beast within him that seeks violent release. Rocky Balboa illustrates well what happens to the minds and bodies of retired sports stars, the feeling of uselessness and decline that overwhelms them. Defined by their physical prowess, age strikes them the hardest and longest. Boxing may be a crude and simplistic manner to find out what you're made of but it’s also a pretty clear cut one if you are willing to accept its harsh terms. As Rocky says 'what’s wrong with standing toe-to-toe with someone and saying “I am?”' This sort of resolute self-dependence defines the character and the ethos behind the franchise that won so many hearts. Rocky the film and the character, and Stallone the actor and director, are anachronisms making their own individual but complexly entwined last stand. The writing and character development have been carefully considered. There’s a direct line from the already on-his-way-out puncher of the first film and the man for whom the exit sign is a distant memory that we see here. Rocky always had a goofy humour and Stallone effortlessly resumes it here, charmingly so. When Balboa accepts the opportunity to prove himself against the young pretender – the wonderfully named Mason ‘The Line’ Dixon – and the training begins, the character – and Stallone - fight for a last chance and the closing of his narrative that both deserve. Has anything changed? Well, Balboa has lost his wife and he’s like a slumped, slurring shadow of his former self. There is the overriding sense of an impending tragedy. However, as he sheds the pounds and bulks up, it feels like the intervening years (in his life and my own) have been nothing more than time served. ‘The older I get the more things I've got to leave behind’ says Rocky, begging for a discretional license. So, he no longer has nothing to lose, no longer the hungry kid with a mean right. Rather, the character is adrift and as undefined as his flabby physique – looking for an arena in which he means something again. Who are the commission or we to take that away from him? The big fight itself has clearly been filmed before a real-world major event. The format switches to digital - for practical reasons - and this has a surprisingly naturalistic resonance. The crowd are also in on it and there’s no reason to believe that their affection for Rocky is not as real or even more so than the pay-per-view bums they are there to watch. If anything, the lack of depth and heroics of the modern heavyweight division make it at least plausible that the more wily fighters of fifty or so could jab their way through a title shot with dignity. Bar the freakish Russian Nicolay Valuev, there’s no one out there to worry a legend long past his prime. Stallone has been brave enough to leave in certain clumsy takes which betray the care and respect that he has approached the character this time round. The comic book villainy of Clubber Lang, Ivan Drago and Tommy Gunn is no where to be seen. Mason ‘the Line’ Dixon is a good boxer with no-one worth fighting. It’s a polished performance by Antonio Tarver, shyly believable. His character is also looking for a test, the key to his own basement. The fight is less spectacular and sensational than the masochistic contests of Rocky I and II, and Stallone / Balboa shows the sag of age. However, the naked aggression of Stallone to prove himself and his character is undeniable and can be felt in the physical pounding he is prepared to take as Balboa and the critical mangling he will inevitably face as director. The story of Rocky Balboa comes to an end neatly, almost as if a dead man has been allowed to choose the manner of his exit from beyond the grave. Stallone has obliterated the memory of the abysmal Rocky V and redrawn Balboa as a classic American character defined by his ability to take a battering without losing his feet or his head. It was an absolute pleasure to watch the film and wave farewell to such an inspirational force.